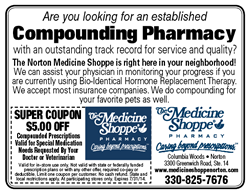 We are a family owned, traditional and compounding pharmacy located in Norton, Ohio. From a wide variety of over the counter products, to medications made specifically for your individual needs — the caring pharmacists and staff are always dedicated to your health. At the Medicine Shoppe Pharmacy, you’re not just a patient; you’re part of the family. Please have a look around and see what our pharmacy has to offer you and your family!